Certain foods can act to increase or decrease memory and cognitive function. This is true for healthy normally functioning people, but is especially true for people suffering from dementia. Here, we point out certain foods that are among the best and worst to consumer for people with Alzheimer’s. This Includes dark lettuces, spinach, kale, as well as cruciferous vegetables such as cabbage and broccoli. A good rule of thumb to follow is that the deeper and darker the color of a vegetable, the healthier it is. Something like iceberg lettuce may not be unhealthy, but it doesn’t do anything to help. If you have a choice, always go with the healthier option. Fish are high in omega-3 fatty acids, which are known to have a great effect on brain function. As a substitute, beans and seeds also contain omega-3 fatty acids. These foods were once considered unhealthy, but a lot of recent research has shown that in moderation, chocolate (dark chocolate in particular) and wine are beneficial for brain function. This primarily is because these foods are high in antioxidants. Berries and other dark-skinned fruits are also very high in antioxidants. When it comes to these items, recall the rule of thumb about dark skinned fruits and vegetables. Fats are part of a healthy diet, but you should avoid animal fats in favour of healthy plant based fats like olive oil and the fats found in nuts and avocado. This includes a wide variety of foods, including pop and candy, as well as ‘white’ grain-based foods like pasta and white breads. These foods tend to contain chemicals and preservatives that can impair brain function. These are examples of unhealthy fats that should be avoided in favour of olive oil. In addition to containing harmful chemicals and preservatives, fast foods tend to be largely devoid of beneficial vitamins and minerals. Red meat can be part of a healthy diet, and some experts believe some read meat is essential, particularly in old age. However, consumption of red meat should be limited to about 4 meals per week. 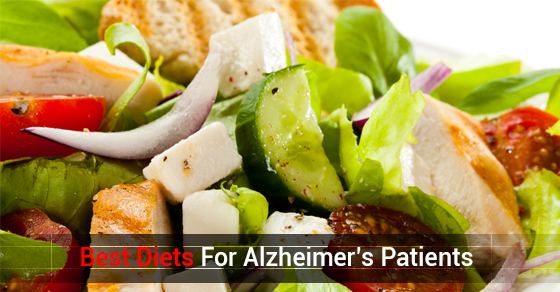 Eating according to the guidelines outlined here will benefit someone suffering from Alzheimer’s. Doing so will also increase the cognitive functioning of healthy people, and decrease the likelihood of developing Alzheimer’s. Obviously, the categories established here align with what one would generally consider healthy vs. unhealthy foods. Following these guidelines will also generally increase your health and vitality.